Delightful Repast: Enough Already with the Garlic! Okay, I know this is going to ruffle a lot of feathers, but it must be said. Too many cooks, home and professional, think Garlic Equals Gourmet. And it just doesn't. I don't spend all this time, money and effort procuring the best ingredients I can find only to take them home and bash them over the head with a boatload of garlic. Take my pizza recipe on this blog, for example. I make it with no garlic at all (except what is in the pepperoni), and some of the biggest garlic users I know don't even miss the garlic. They exclaim over the taste and texture of the crust and how they can really taste the tomatoes and cheese. Yes! There are other flavors in the world besides garlic, but they can only be tasted and appreciated when they are not completely overwhelmed by too much garlic. This is not to say that I don't like garlic. I do. But when something is not the main ingredient in a dish, it should enhance the main ingredient, not steal the spotlight. And a meal should have a variety of flavors. If one dish has garlic, the others need not. I've been disappointed by many an expensive meal when everything--bread, main dish, side dishes and salad--was loaded with garlic. I want to march in and tell the chef, Don't be a Johnny One Note in the kitchen! Many dishes that typically have garlic can be greatly improved by using less or, in some cases, no garlic. However, there are some things that even I think simply must have a little garlic. (And when I say garlic, I don't mean garlic salt or garlic powder or chopped garlic from a jar. Those are three items that need to be ... Oops, I don't want to get into one of those Oprah versus the Beef Industry things!) One of these is hummus. There is no hummus without garlic, but it only needs a tiny bit. In bowl of food processor, place all ingredients. Process until smooth. If you prefer a thinner consistency, add a little more lemon juice, olive oil or water. Taste, and make adjustments accordingly. Put into serving dish and cover with plastic wrap directly on the surface. Refrigerate for at least a few hours before serving or overnight. Garnish with a drizzle of olive oil and a little finely chopped mint, flat-leaf parsley or pistachios. 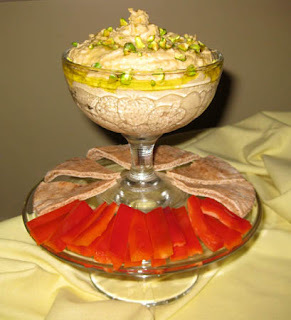 Serve with whole wheat pita wedges, Armenian cracker bread and raw vegetable strips. I must say I do love Garlic! And at times I have gotten carried away with those little odorous cloves! Infact, while we were living in Oregon for a year or so, I started making roasted garlic with olive oil on a regular basis. I must have had an aura of garlic aroma. One day I went into a little country store and the old guy at the counter said, You must be from California....What, I said. Well son we don't eat Garlic like you do up here in Oregon. Well I've since learned to cut back on my garlic addiction, although I do fall off the wagon once in the while. Oh by the way, A good substitute for Garlic is Shallots. My feathers are ruffled--we love garlic! We put healthy size cloves in ours. Jeani! It was soooo delicious! I have to tell you that 'Stewball' told me he didn't like hummus and he really liked this one! I also experimented with an artichoke dip (using TJs frozen) and it was super yummy too. We've been snacking for dinner a lot lately. Oh and while I'm here, I'm checking out you link to organic beef--I'm hoping that's our next step. Thanks again! Thanks, Pegi! Glad you liked it. And I like ruffling feathers! Carole, thank you That was fun! No feathers ruffled here, Jean! And I even make my hummus using roasted shallots! I think we should start a garlic allergy support group! But, like you, even if I weren't allergic to garlic, I think we used to much! We, as Americans, see one clove of garlic in a recipe and think seven will be better. It's just not true. It covers exquisite flavors, makes everything taste the same, and is the sign of a non-creative chef. So glad you found my blog so that I now am subscribed to yours! David, thank you so much. I'm going to try roasted shallots in my next hummus. And I'm looking forward to catching up on six years of your blog!